The ER Series motors by Exlar are explosion-proof motors rated for Class 1, div 1, Groups B, C, and D. These actuators are suitable when the air may contain flammable vapors in concentrations high enough to create a risk of a explosive or ignitable atmosphere. Group B includes atmospheres where hydrogen or similar gases, such as manufactured gas, may be present. Group C includes ethyl-ether, ethylene or cyclopropane. Group D includes atmospheres where gasoline, alcohol, acetone, butane, hexane, naphtha, benzene, benzol, lacquer solvent vapors, or natural gas may be present. (ER series motors are not recommended for acetylene atmospheres.) The Exlar ER Series features a brushless, permanent magnet motor with an integrated planetary gear reducer. The planetary gear reduction offers high torque and high reliability with low backlash. 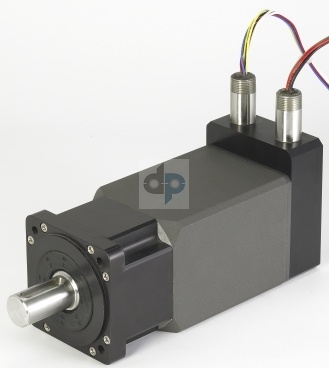 The ER Series motor is compatible with any servo drive control system. The Exlar SV Series digital servo control system is particularly well-matched for the ER Series motor. The ER Series motors feature a unique winding design that results in a highly efficient and durable motor with higher torque than other similarly sized motors. 115 = 115 mm (Optional) When reduction ratio is ommitted, unit is a motor only, no gearhead. XX1 = Custom Feedback Mount - purchaser must supply dawing of feedback device and desired wiring drawings. 001 = Standard Feedback Mount - actuator is supplied ready for size 15 resolver, includes .375 mm shaft. 002 = Standard Feedback Mount - actuator is supplied ready for size 15 resolver, includes 8 mm shaft.